Detailing the physical features, habits, territorial reach and other identifying qualities of the California Swollen Stinger Scorpion. Spying the small bulge just before the stinger of the California Swollen Stinger Scorpion is not worth the risk of close proximity. 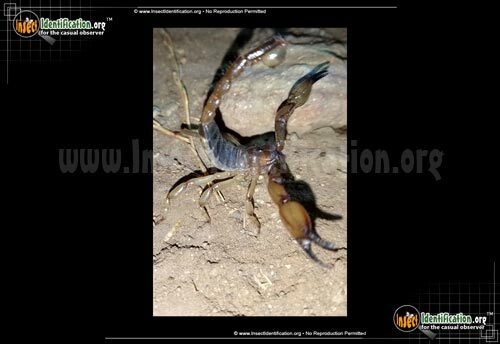 Dark, brown coloring make it harder to see the California Swollen Stinger Scorpion at night. It also helps hide it during the less active daytime. Huge, brown pedipalps look more like mighty claws with dark brown or black tips. Tiny dark bumps run along the squared ridges on them. These mighty 'arms' hold down insect prey, allowing the scorpion to begin eating it with strong jaw-like chelae. 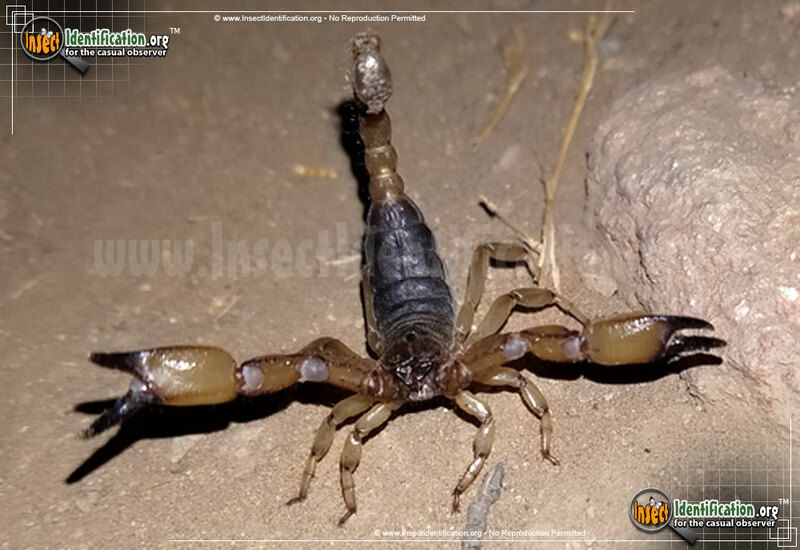 Oftentimes, the California Swollen Stinger Scorpion stings it by curling its long tail forward, thrusting the stinger into the insect. A venom gland injects a paralytic substance that subdues the prey, allowing the scorpion to eat without a struggle. The dark brown body may be wide or slender, with females appearing a bit larger than males. The legs, tail, and 'arms' are a medium brown. In the center of the plate-like carapace (head region), sit a pair of eyes. More eyes are on the sides of the 'face'. The large, round, last tail segment is a shade paler than the rest of the tail and has a small swollen bulge just before the stinger. A sting from this scorpion is indeed painful, causing swelling and redness for a day or so, but it is not a deadly species. Maintaining tight seals on doors and windows can help keep the California Swollen Stinger Scorpion from wandering indoors. Removing wood piles, debris, or other areas that could hide them is also good practice.